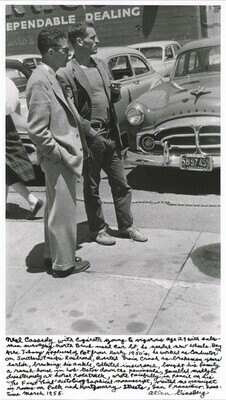 Home » Collection » Neal Cassady with cigarette young & vigorous age 29 with salesman surveying North Beach used car lot, he needed new wheels. Bay Area Johnny Appleseed of pot from early 1950’s, he worked as conductor on Southern Pacific Railroad, averted train crash as brakeman years earlier, breaking his ankle, collected insurance, bought his family a ranch-house in Los Gatos down the peninsula, gambled madly & disastrously at horse racetrack, wrote painfully in pencil on his “The First Third” autobiographical manuscript, visited me overnight in rooms on Polk and Montgomery Streets, San Francisco, sometime March 1955. Neal Cassady with cigarette young & vigorous age 29 with salesman surveying North Beach used car lot, he needed new wheels. Bay Area Johnny Appleseed of pot from early 1950’s, he worked as conductor on Southern Pacific Railroad, averted train crash as brakeman years earlier, breaking his ankle, collected insurance, bought his family a ranch-house in Los Gatos down the peninsula, gambled madly & disastrously at horse racetrack, wrote painfully in pencil on his “The First Third” autobiographical manuscript, visited me overnight in rooms on Polk and Montgomery Streets, San Francisco, sometime March 1955.
signed by artist, lower right on sheet in black ink: Allen Ginsberg; artist inscription, across bottom under image: Neal Cassady with cigarette young & vigorous age 29 with salesman surveying North Beach used car lot, he needed new wheels. Bay Area Johnny Appleseed of pot from early 1950's, he worked as Conductor on Southern Pacific Railroad, averted from crash as brakeman years earlier, breaking his ankle, collected insurance, bought his family a ranch-house in Los Gatos down the peninsula, gambled madly & disasterously at horse racetrack, wrote painfully in pencil on his "The First Third" autobiographical manuscript, visited me overnight in rooms on Polk and Montgomery Streets, San Francisco sometime March 1955. Allen Ginsberg Estate; Ellen and Gary Davis, Greenwich, CT (through Howard Greenberg Gallery, New York); gift to NGA, 2009. Beat Memories: The Photographs of Allen Ginsberg, National Gallery of Art, Washington; National Gallery of Art, Washington; Grey Art Gallery & Study Center, New York University, New York; The Contemporary Jewish Museum, San Francisco, 2010 - 2013, no. 54.